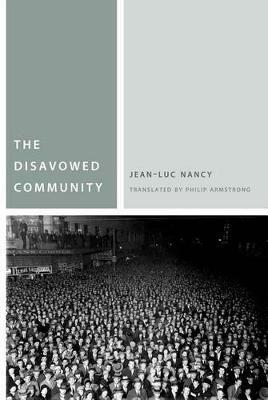 Over thirty years after Maurice Blanchot writes The Unavowable Community (1983)-a book that offered a critical response to an early essay by Jean-Luc Nancy on "the inoperative community"-Nancy responds in turn with The Disavowed Community. Stemming from Jean-Christophe Bailly's initial proposal to think community in terms of "number" or the "numerous," and unfolding as a close reading of Blanchot's text, Nancy's new book addresses a range of themes and motifs that mark both his proximity to and distance from Blanchot's thinking, from Bataille's "community of lovers" to the relation between community, communitarianism, and being-in-common; to Marguerite Duras, to the Eucharist. A key rethinking of politics and the political, this exchange opens up a new understanding of community played out as a question of avowal.